A collection of original food recipes & articles. I’ve been craving a good, smoked ham. Easter sounded like a good time as any to tease the senses for 4 hours. I had to really think about what kind and size of ham to purchase. Easter time of course has many sales that go on, you can’t go more than a few minutes without hearing or seeing an add promoting “the best price” around. The first question to answer was, should it be pre-cooked, partially cooked or uncooked? After talking with others and reading about it, I decided on pre-cooked. 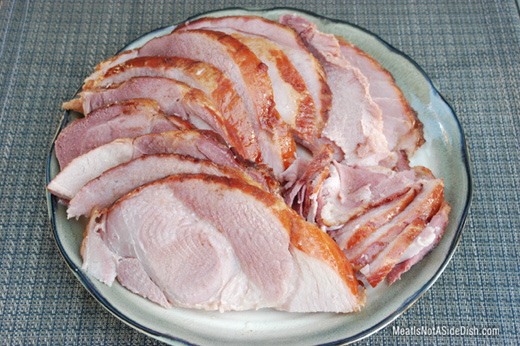 It is MUCH easier to find a pre-cooked ham, in fact, most grocery stores do not carry partially cooked or uncooked ham. For obvious reasons, it is also easier to smoke a pre-cooked ham. It only needs to reach an internal temperature of 140F, as opposed to an uncooked at 160F. My choice ended up being a 6.5 lbs cured SilverStar Premium, Lower Sodium, Fully Cooked, Semi-Boneless Ham. The night before, I decide to use this Smoked Ham Marinade recipe. It only took a few minutes to prepare and I was happy with how easy it was, so I knew I couldn’t go wrong. The trick is, to do this all over again about 1 hour before it is finished smoking. I figured 4 hours of total time smoking would be enough to give it good flavor, so after hour 3, I repeated the above process. 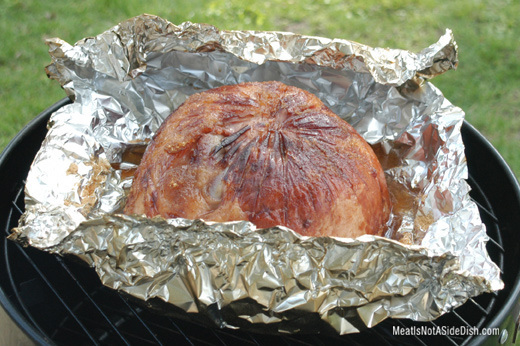 For the smokey flavor, I used Apple Wood Chips (soaked in water, then wrapped in foil with air holes). To help with the citrus flavor, pour a cup or so of extra pineapple juice into your water bin (if you are using one). The result was fantastic, I would seriously do this again for larger gatherings. It was easy, smelled great (your guests will start to crave it) and provided me another excuse to fire up the smoker.